The quotation-marks around ’Calvinism’ in the title are not accidental. 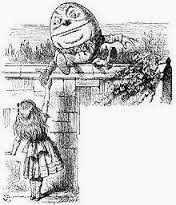 We are here primarily concerned with the issue between Alice and Humpty Dumpty. The issue is about the words, not things, and in particular the fact that various people have various things to say about the word 'Calvinism' at present - its legitimacy, and what it refers to and may refer to. Words can be fought over. Whoever captures the word, captures the thing. But frequently the words resist capture. I shall argue, the word ‘Calvinism’ wriggles freely, for good or ill. I shall sketch two such attempts at capture, one scholarly, the other rougher, to capture the meaning of ‘Calvinism’. Each fails, as it must. The rougher attempt first. There are those who are disquieted over the fact that many are claiming the name ‘Calvinism’ for themselves who are Baptists, and many who are charismatics do the same. Shock-horror! Charismatic Baptists? Where will it end? Such people tut-tut like the Dame in a Pantomime. But it is nothing new for people to adopt the name ‘Calvinist’ or ‘Calvinism’ for something narrow than was produced by the copious theological mind of John Calvin. I remember that in my youth , in the damp cellar of a Preston second-hand bookshop, I came across some books in the series called ‘Doctrinal Calvinism’, published in the nineteenth century. I think that of the two or three titles I retrieved – I have them no longer, alas - one contained a selection of the writings of Bishop Ezekiel Hopkins, another of John Bunyan, and maybe one of John Howe, one-time Chaplain to Oliver Cromwell. An Anglican and a Baptist and a Congregationalist, I believe, each ‘doctrinal Calvinists’. To be sure, that title was not a self-description, but one given to them. But it was not an unreasonable title. I remember also for a time possessing the Works of Hopkins, which Thornton’s bookshop in Oxford sold me, which contained an exposition of the covenants worthy of Witsius. He was Bishop of Londonderry, I believe. The publishers of the books I mentioned no doubt hoped to tap into this ‘Calvinism’ that was common to people in the C of E and among Dissenters. (And now, perhaps, 'charismatic' is a word that also currently receives the Humpty Dumpty treatment.) A smart marketing ploy, in my view. There is a lot more to these chapters of the Confession than the famous Five Points, of course. The adopting of these parts of Westminster was carried out in the conviction that there is a logically contingent connection between the theological material expressed in these chapters, and ecclesiology, as there is. Besides this rather shrill opposition to ‘doctrinal Calvinism’ , as a bona fide expression of Calvinism at a more scholarly level, it is increasingly being pointed out that ‘Calvinism’ is misleading as the name for the theological trajectory of Reformed Orthodoxy. Calvin was a member of a theological team, not a one-man team, nor its captain. What developed after his death in the Reformed Church is no more ‘Calvinism’ than it is ‘Bucerism’ or ‘Zanchism’, even though Calvin achieved a greater prominence than these, for a variety of reasons, not least the prestige of Geneva as a centre of the Reformation. It is also pointed out that what is misleadingly called ‘Calvinism’ can mean less than the ‘Five Points’, and also more than them in that as Reformed theology developed there were various emphases given to Christian doctrine by different individuals and theological schools. An account of some of these differences in respect of the work of Christ can be seen worked out by Richard Muller with his usual care and erudition in Calvin and the Reformed Tradition: On The Work Of Christ And The Order Of Salvation. So within the parameters set not by Calvin but by the various Reformed Confessions there was a considerable difference in emphasis. Confessions of faith are, after all, political documents. These claims about the relatively narrow scope of ‘Calvinism’ in Reformed theology are based on a historiography which pays some attention to lines of sameness as well as of divergence in the teaching of the Reformer. But it recognises that much of the legacy of John Calvin was underdetermined by comparison with the theology that was developed later, theology that even so was indebted to Calvin. Areas of such development are, for example, the decrees of God, and the covenants, and the work of Christ. Calvin cannot be held responsible for theological constructions of his legacy, occurring after his death, any more than, say, Andrew Fuller, who defended the propriety of general invitations of the gospel, can be held responsible for every preaching extravagance that people since Fuller have thought was an ‘offer of Christ’. Those who wish to dissent from these scholarly claims will have their work cut out to do so. They will have to present a much more detailed Calvinism than they are used to doing. 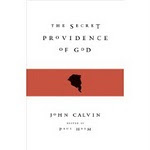 But note that this restriction of ‘Calvinism’ to Calvin’s own theology, and resistance to its extension to the theology that engendered the Confessions, and to which they in turn gave rise, begins with the earlier view of ‘Calvinism’, the ‘Calvinism’ of the Five Points and of doctrinal Calvinism. (Not the same thing, but each has a solely soteriological emphasis.) The scholarly critique recognises or legitimises that ‘doctrinal Calvinism’ we noted earlier, legitimises it by taking it seriously. Its critique is more scholarly than that of the whingers were noted earlier, but it is a criticism which legitimises what it is a criticism of. Not even scholarship is capable of copyrighting ‘Calvinism’. Whichever it is, no-one can stop you calling your choice ‘Calvinism’. You see, unlike ‘Cadbury’s’ or ‘Chevrolet’ or ‘Calvin Klein’ ’ there is no copyright or trademark that covers the use of the word ‘Calvinism’. 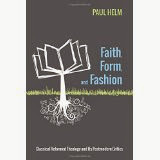 Any more than with 'inerrancy' or 'justification' or any other central theological term. An observant reader of John Calvin’s Institutes will have noticed that the Reformer discusses the interesting and important question of Christian liberty in two places. The first is in Chapter 19 of Book III, appropriately entitled 'Of Christian Liberty’, where he is dealing with soteriology and is at this point concerned with the consequences of justification. One of these consequences is freedom, freedom from the keeping of any law, whatever its shape and size, for justification. The second time he discusses Christian liberty is in Chapter 10 of Book IV ‘On the Power of Making Laws’ dealing principally with the church, and the root error of Roman Catholic Church in imposing on the Christian laws of its own making, but also dealing with civil society which make law for human good. Calvin’s approach is the same in both cases. Justified sinners possess liberty over the many things that are neither commanded nor forbidden by God, indifferent matters. This is a two way freedom, hence 'indifferent'. The freedom to exercise to and claim the right to wear what coloured polo-shirt you should wear, but also not to insist on always wearing your favourite Postman-Pat Red. 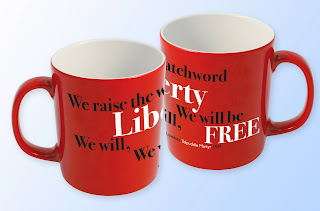 The rich may live in luxury, but they have liberty not to. Those who like a drink may enjoy one, but it is also a part of their liberty for them to abstain. And so on. ‘Indifference’ rather than 'liberty’ emphases that the expression of freedom may go either way. Even though the State is a divinely-ordained its laws are not divine laws, as are those which constitute the church, and which regulate its life. This is a rather surprising result, when you think of it. The church is not free to make new laws, but the state is. Are we free to disobey the state? The matters over which the state legislates may be indifferent as far as the law of God is concerned. The law of God neither commands nor forbids the imposition of a 30 mph limit. But it must be obeyed nonetheless. Its laws ought to be kept conscientiously unless they flout the commands of God. So Christian liberty has nuances to it. Conduct respecting ‘things indifferent’ is not to be indulged or flaunted, and the Christian as a respectful citizen is to keep the laws of men, because they are made law by a God-given power. Hence a law is said to bind the conscience, because it simply binds the individual, without looking at men, or taking any account of them. For example, God not only commands us to keep our mind chaste and pure from lust, but prohibits all external lasciviousness or obscenity of language. My conscience is subjected to the observance of this law, though there were not another man in the world…..’ (III. 19. 16). This is rather different from the modern view of liberty according to which we can do what we like provided that it does not harm others. Or from the attitude of those who seem never get over the novelty of having been emancipated from Fundamentalism, and whose clothes tend to smell of tobacco and booze as a consequence. As regards the church and liberty, Calvin’s treatment is a robust account of what is these days called the ‘spirituality of the church’. The Christian, made free by Christ, has a spiritual liberty, which must be safeguarded and preserved unimpaired. The governance of the church is quite different from the governance of the state. The church is to be structured and ruled by the revealed word of God. All his commands and only his commands are to inform Christian preaching and to sensitise the Christian’s conscience. This also – paradoxically, it may seem at first – is to be understood as a Christian freedom, freedom from the impositions of men. Rome burdens the conscience of worshippers with newly-invented obligations. Even though Calvin has the excesses of the Papal church in mind his argument is a perfectly general one, covering churchly impositions of any kind. The two are each divine jurisdictions, though they operate differently, and do not have equal importance. Each should give rise to conscientious action on the part of the Christian. So it is not the case that the first is God’s kingdom, the second the godless, purely secular ‘world’. The second a divine jurisdiction too. In the dust raised by the current renewed appreciation of the Reformed doctrine of the two kingdoms, through the work of David Van Drunen and others, it is sometimes asked, in adopting the doctrine of the two kingdoms, what becomes of the divine cultural mandate? In the hands of Abraham Kuyper and the neo-Calvinists, this mandate has become the work of the kingdom, as distinct from the church, and part of the Christian's endeavour to transform society by promoting Christian this and that: Christian education, politics, art, literature, care for the environment, and so on. This has become a familiar theme, some being sanguine about the prospects of such transformation, stressing the place that such endeavours have as an expression of God's 'common grace', others from the same stable stressing the 'antithesis' between Christian cultural endeavours and those of the secular world. These attitudes have no more than the status of private opinions, the relevant attitudes and actions being neither commanded by the word of God as a part of Christian worship or conduct, nor required by the state. To add 'cultural transformation' to Christ's command to his first disciples to go into all the world and preach the gospel, would (in Calvin's view) jeopardise Christian liberty, and no doubt we could add that it would be to privilege the educated middle-class Christians over their blue-collar fellow believers. A command, or a kind of culturally-correct pressure on Christians to transform society, could amount to a new law, and if it came to that it would infringe the spirituality of the church and the liberty of Christians. In respect of life in the Church, freedom from the observance of man-made traditions or activities which a person is required (by some religious or other 'authority') to keep. In respect of Society, freedom to do (or not to do) matters indifferent, neither forbidden nor commanded by God, and otherwise to be conscientiously obedient to the law of the state, except when such obedience would be a sin.